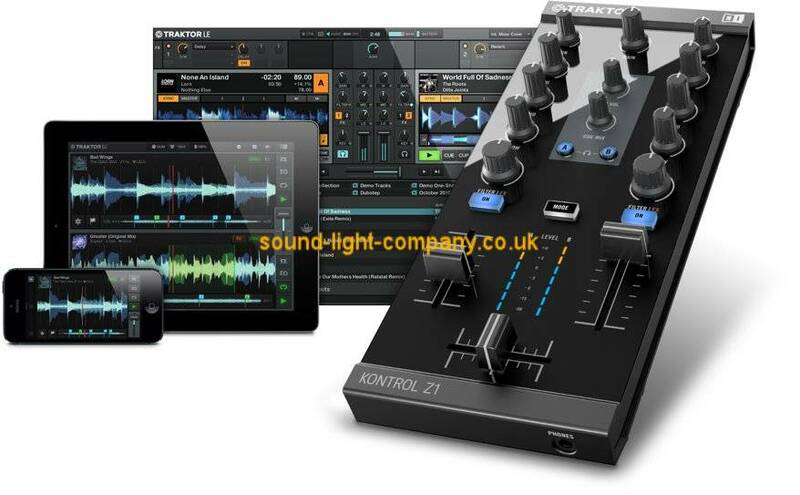 • Mixing interface with 3-band EQ, built-in 24-bit soundcard Announcing TRAKTOR KONTROL Z1 WORLD'S SMALLEST PRO DJ MIXER TRAKTOR KONTROL Z1 is the ultra-compact 2-channel mixer, controller, and soundcard for TRAKTOR DJ and TRAKTOR PRO 2. LITTLE GIANT Mix and pre-listen to your tracks with pro precision. Dedicated controls for two channels give you intuitive, tactile control over volume, EQ, filters, and effects. And the built-in 24-bit audio interface delivers powerful, club-ready sound. A CLOSER LOOK EQs and Filters Tweak your sound with robust 3-band EQ, gain, and filter knobs. Cue Section Pre-listen to each channel. The Cue Mix knob adjusts the cue/master balance. The Cue Volume regulates headphone volume. Channel Faders Mix effortlessly with pro-grade faders. The easy-to-read level meters provide instant visual feedback. iOS READY The Z1 turns your iPad or iPhone into a tactile, two-channel TRAKTOR DJ rig. Cue-up the next track in your headphones while the current track still plays for the crowd. Mix, adjust EQ, and apply filters or effects. TRAKTOR KONTROL Z1 even keeps your turned-on iOS device charged with the NI Power Supply while you play - never worry about battery life when your set hits its peak. TRAKTOR PRO - ON-THE-GO TRAKTOR KONTROL Z1 also offers ready-to-go compact control of TRAKTOR PRO EQs, filters, and FX Units on two channels at a time, keeping you ready for the afterparty - always. It doesn't end there: Expand your creative possibilities by adding TRAKTOR KONTROL X1 to the rig and control effects, loops, and transport functions like play and sync. WHAT'S INCLUDED TRAKTOR KONTROL Z1 comes with the introductory TRAKTOR LE software to get you started. Two software decks, three effects, and all you need to get the party going. And when you're ready for more, go pro. The Z1 includes a £44.00 e-voucher - use it to purchase TRAKTOR PRO 2 or any other downloadable NI software. TRAKTOR KONTROL Z1 with TRAKTOR KONTROL X1 - control loops, cue points, and effects in TRAKTOR PRO 2. Add TRAKTOR KONTROL F1 for dedicated Remix Deck control. With TRAKTOR DJ for iPad - immediate, hands-on control over both decks. The same setup with TRAKTOR DJ for iPhone. THE PRESS ON TRAKTOR KONTROL Z1 "The Traktor Kontrol gives you a high quality sound card, headphones monitoring, and just the controls you need to mix expressively while doing the 'touch the music' stuff over on the iPad." Digital DJ Tips "The Z1 is far and away our favorite iOS-related DJ device we've seen so far." MusicRadar "The Z1 is a well designed and executed purely functional piece, that plugs, plays, and importantly works exactly as intended."